Alan Anderson is featured in two definitive new works on costume jewelry. 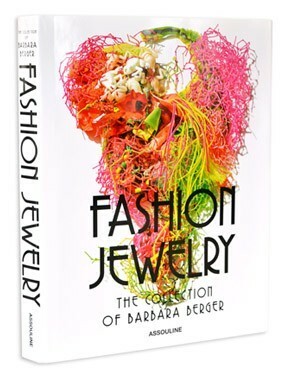 Anderson is one of the noted designers highlighted in the just-launched exhibit at New York’s Museum of Arts and Design, Fashion Jewelry The Collection of Barbara Berger. Berger is renowned as one of the world’s foremost collectors of costume jewelry and according to fashion guru Iris Apfel, “The First Lady of costume jewelry.” The exhibition, which opened June 25, 2013 showcases over 450 pieces of fashion jewelry from her 4,000+ collection. Two of Anderson’s collars, a multi-layered, pastel floral collar in rose, opaque turquoise and peridot Austrian crystal in rhodium plate, as well as a lacy bib in tanzanite, amethyst and rare, carved opaque yellow stones in gold plate, are on display. Simultaneously, a new Assouline book to accompany the exhibit, “Fashion Jewelry: The Collection of Barbara Berger” features the Anderson pastel floral collar. The book, with a forward by Pamela Golbin, chief curator of Paris’ Musée de la Mode et du Textile; an essay by Iris Apfel and text by jewelry historian Harrice Simons Miller, features the works of costume jewelry legends that include Maison Gripoix, Dior and Miriam Haskell, and contemporary international designers such as Iradj Moini and Robert Sorrell. With designers listed alphabetically, Anderson is the first feature profile in the stunning tome.